Fleet management is a process or an approach that enables companies to systemize and co-ordinate work vehicles with the aim to reduce costs, improve efficiency, and provide compliance to government regulations. Solutions such as driver management, vehicle management and operations management are encompassed in the scope of fleet management solutions. The rising adoption of fleet management analytics and a shift towards smaller fleets are some of the reason that are expected to drive the fleet management solution market in the next few years. The market is also expected to benefit from the vast technological advancements recently observed in the field of automatic vehicles. Transparency Market Research estimates that the global fleet management solutions market will exhibit an exponential CAGR of 22.6% during the period between 2017 and 2025, rising from a valuation of US$12.57 bn in 2015 to US$91.94 bn in 2025. On the basis of deployment, the global fleet management solution market is segmented into cloud and on-premise. The cloud-based deployment segment is anticipated to contribute major share in the global fleet management solution market. With the increased demand and adoption of Software as a Service model, the cloud deployment segment is anticipated to witness rapid and steady growth throughout the forecast period. The on-premise deployment segment is expected to hold a comparatively smaller share of the global fleet management solution market. On the basis of type, the global fleet management solution market has been segmented in the report into vehicle management, driver management, and operations management. Of these, the segment of operations management solutions is expected to hold the dominant share of the global market throughout the forecast period. The segment is expected to be followed by the segment of vehicle management solutions in terms of market share. Moreover, the vehicle management solutions segment is also projected to be the segment with the most promising growth opportunities owing to high rate of growth. This segment is expected to grow at a CAGR of 24.7% during the period from 2017 to 2025. This growth is primarily attributable to increased demand for green fleets. The global fleet management solution market is expected to be led by North America throughout the forecast period. The North America market for fleet management solutions is estimated to contribute a massive share in the global market over the forecast period, with the U.S. providing most of the revenue. The presence of key industry players along with support from OEMs is expected to drive the market in the region. Europe is expected to follow North America in terms of market revenue. The presence of several local industry players, increasing trade through Pan-European corridor and the growing awareness about technology and solutions is expected to drive the market in the region. Favorable regulatory initiatives in the region are also expected to add to the market growth. The market in Asia Pacific is expected to be lead in terms of growth rate over the report’s forecast period. This growth is expected to be driven by demand across countries such as China, Japan, and India, while South East Asian countries with their superior infrastructure and impressive communication network are also expected to contribute substantially to the region’s growth. Some of the leading players operating in the global fleet management solution market are Trimble Inc., Element Fleet Management Corp., Daimler Fleet Management GmbH, JDA Software Group, Inc., Wheels, Inc., MiX Telematics Ltd., TomTom Telematics BV. , Magellan Navigation, Inc., Emkay, Inc., and Telogis, Inc. This report on the global Fleet Management Solution market provides analysis for the period 2015–2025, wherein 2016 is the base year and the period from 2017 to 2025 is the forecast period. Data for 2015 has been included as historical information. 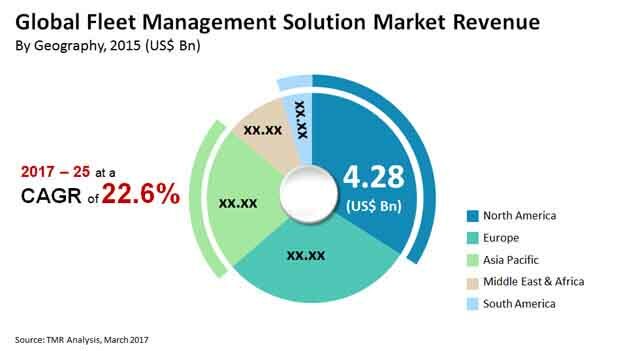 The report covers market dynamics including drivers, restraints opportunities, and trends expected to influence the global Fleet Management Solution market growth during the said period. Technologies that are playing a major role in driving the global Fleet Management Solution market have also been covered in the study. The study provides a comprehensive analysis on market growth throughout the above forecast period in terms of value estimates (in US$ Bn), across different geographies. The Fleet Management Solution market has been segmented on the basis of deployment, type, end-use industry and geography. Based on deployment, the market has been divided into cloud and on-premise. Based on the solution type, the market has been divided into vehicle management, driver management and operations management. Based on the end-use industry the market has been divided into Transportation & Logistics, Automotive, Retail, Government and Shipping. Cloud based deployment could be defined as delivery of hosted services over the internet. Cloud based deployment model can include Public, Private and Hybrid Cloud whereas On-Premise deployment model would refer to the computation that is located within the physical confines of an organization. Vehicle Management Solutions would refer to a system that provides management functions which allow organizations to manage vehicle’s fuel consumption, services etc. while Driver Management Solutions would refer to a system that provides management functions which allow organizations to manage driver’s behavior, driving habits etc. to ensure safety. Moreover, Operations Management Solutions would refer to a system that provides management functions which allow organizations to the operations of the fleet. These solutions are necessary as organizations try to cut the costs of the operations while complying with the regulations. On the basis of end-use industry the global fleet management solution market can be segmented into Transportation & Logistics, Automotive, Retail, Government and Shipping. Geographically, the report classifies the global Fleet Management Solution market into North America, Europe, Asia Pacific, Middle East & Africa (MEA), and South America; the regions are analyzed in terms of market revenue. Furthermore, region wise prominent countries covered in the report include the following - the U.S, Canada, Germany, France, the U.K., China, India, Japan, South Africa, UAE, Saudi Arabia, Brazil and Argentina. The report also includes key developments in the Fleet Management Solution market. Porter Five Force analysis is also included in the report. The report also covers segment wise comparison matrix, market attractiveness analysis and market share analysis for all regions covered in the scope of study. The report also includes competition landscape which include competition matrix, market share analysis of major players in the global Fleet Management Solution market based on their projected value share, and business profiling of major players. The Competition Matrix benchmarks leading players on the basis of their capabilities and potential to grow. Factors including market position, offerings and R&D focus are attributed to company’s capabilities. Factors including top line growth, market share, segment growth, infrastructure facilities and future outlook are attributed to company’s potential to grow. This section also identifies and includes various recent developments carried out by the leading players. Company profiling includes company overview, major business strategies adopted and SWOT analysis. Major players in the Fleet Management Solution Market include Trimble Inc., Element Fleet Management Corp., Daimler Fleet Management GmbH, JDA Software Group, Inc., Wheels, Inc., MiX Telematics Ltd., TomTom Telematics BV. , Magellan Navigation, Inc., Emkay, Inc. And Telogis, Inc.